Nansen Center scientists in Bergen and St. Petersburg have jointly studied how European wind energy resources may change in the future, with a focus on the Black Sea. Nansen Center scientists Drs. Victoria Miles and Igor Esau have published the paper Spatial heterogeneity of greening and browning between and within bioclimatic zones in northern West Siberia in Environmental Research Letters. Drs. Richard Davy and Igor Esau, NERSC.Nansen Centre Scientists Drs. 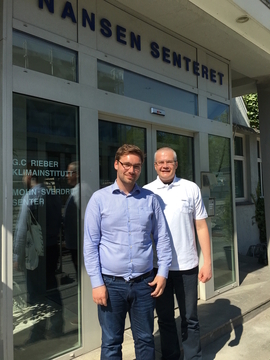 The project will investigate an ecosystem and societal adaptation to warmer micro-climates created by anthropogenic heat pollution in the urban arctic over the last 30 – 40 years. Even on the background of the amplified arctic warming, this heat pollution has created permanent urban heat islands (UHIs) where urban temperatures are by one-two degrees higher than those in the surrounding areas. Distinct to mid- and low-latitudes, such pronounced UHIs in the arctic are found even in small settlements like Longyearbyen, Svalbard with 2500 inhabitants.